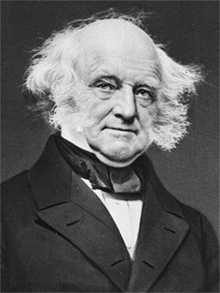 America’s eighth president, Martin Van Buren, battled a devastating economic contraction throughout his four-year tenure. There is no record of Van Buren sending White House Christmas cards and very little is written about how America’s first Dutch president and his family celebrated the holiday during those trying times. Van Buren’s most enduring Christmastime contribution is that he chose the color of decor for the White House State Room (which became known as the Blue Room, and has maintained the same hue ever since), where the official Christmas tree would come to be placed and holiday celebrations would be held each year. 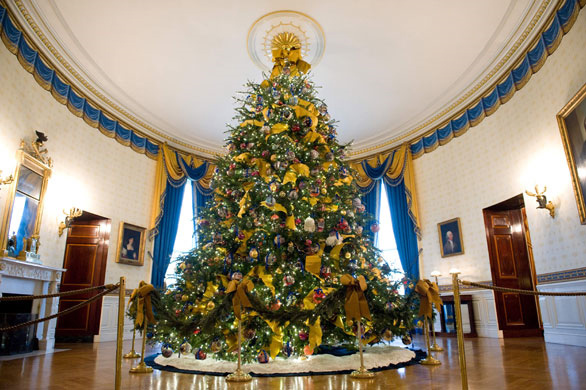 Throughout his life and presidency, a number of important and sometimes historic events took place during the Christmas season. Van Buren assumed the governorship of New York one week after Christmas of 1828. As payback for a political feud with Vice President John Calhoun, his appointment as U.S. Minister to Great Britain was overturned by Congress exactly one month after Christmas of 1831. In his First Presidential Address to Congress, at the beginning of the 1837 Holiday season, Van Buren called for the establishment of an independent treasury to combat the deep banking crisis. Then, four days after Christmas, the “Caroline Affair” took place when Canadian troops seized a U.S. steamboat which had been leased to Canadian insurrectionists. One American was killed. A week later, the president issued a proclamation warning U.S. citizens not to assist in the Canadian revolt and dispatching Federal troops to the Maine border. For the next few holiday seasons, no White House Christmas cards were sent to the Queen of England (Canada was still a British colony). Later, one day after his final Christmas in the White House, tensions with Great Britain eased when Alexander McLeod was found not guilty of murder. McLeod, a Canadian, has been arrested in New York for his involvement in the Caroline Affair. Martin Van Buren was born at the start of the Christmas Season on December 5, 1782 in Kinderhook, New York. His father, Abraham, was a farmer and tavern-keeper. In 1796, Van Buren became an apprentice to lawyer Francis Silvester, and he began his own Kinderhook practice in 1803. In 1807, Van Buren married his cousin, Hannah Hoes, and the couple would have four children. A few years later, he entered public life, serving as a New York State Senator, New York Attorney General, and then U.S. Senator from New York. Hannah died of tuberculosis in 1819 and the heartbroken politician would never remarry. His daughter-in-law, Angelica Singleton Van Buren, would perform the duties of the First Lady when Van Buren was elected to the presidency. While living in the White House, Martin Van Buren chose the color and decor of the Blue Room, which today houses the official White House Christmas tree during the holiday season. Philosophically, Van Buren considered himself a disciple of Thomas Jefferson, supporting the doctrine of states’ rights, opposing a strong central government, and voting against most federally-funded internal improvements. After John Quincy Adams’ election in 1824, he, along with several prominent Jeffersonian politicians, founded the Democratic Party. He briefly served as Governor of New York, Secretary of State for Andrew Jackson and Minister to Great Britain. In 1832, riding a populist wave, Andrew Jackson was elected to the presidency with Van Buren on the ticket as his veep. With a pledge to continue Jackson’s regulatory policies, he was elected to the Presidency in 1836 over three candidates fielded by the fractured Whig Party. Within three months of taking office, the country was in crisis due to the onset of the Panic of 1837. This economic calamity was built on an era of dangerous speculative investing. The bubble burst on May 10, 1837 in New York City, when every bank stopped payment in gold and silver coinage. The Panic was followed by a five-year depression, with the failure of banks and record-high unemployment levels. To combat the crisis, Van Buren came up with a plan to move federal funds from state banks to an “independent treasury.” The plan narrowly passed Congress after a bitter political battle which saw many conservative Democrats defect to the reformed Whig Party. Van Buren’s public standing took another hit due to the long and costly Second Seminole War in Florida, and his refusal to support the annexation of Texas, which he felt would risk war with Mexico and boost pro-slavery forces. In 1839, the Aroostook War, a series of armed clashes between Americans and Canadians along the Maine-New Brunswick border, broke out. General Winfield Scott was sent to restore order and negotiate an official line of demarcation. In an attempt to woo pro-slavery voters, Van Buren sided against the African slaves on trial for their role in the Amistad mutiny. He later established a 10-hour workday limit for all federal public-works projects. With the country disgruntled after four years of economic strife, Van Buren was soundly defeated in the election of 1840 by the Whig candidate, William Henry Harrison. He ran again for the presidency in 1848 on the Free-Soil (antislavery) ticket, but received less than 10% of the vote. He spent several years in Europe before retiring to his estate, Lindenwald, back in Kinderhook. He died in 1862 at the age of 79. I’m going to admit I had no idea who our eighth president was! Shameful I know but who really knows all of them right? These mini courses on American history of the presidents are great. Thanks to whomever thought to put this site together. Very interesting stuff.